So I just got back from a great weekend at the Fan Expo in Toronto. Kind of a long day as far as "jamming things into one day" goes, but it's done. I managed to score 24 issues of Blue Devil, 3 DP Archives (what can I say, I've been delinquent on getting those) and a DCUC Ronnie Raymond Firestorm. 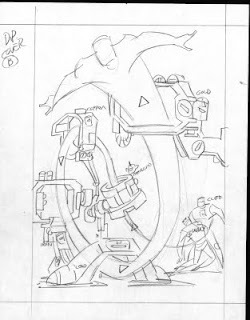 I also got the first two sketches for my Doom Patrol sketchbook - more on those later this week. 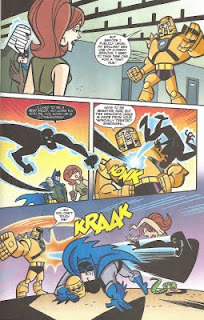 For now, I want to share the most recent Doom Patrol-related Source posting. Elisabeth Gehrlein gave us a sneak peek of the third variant cover for Doom Patrol. Sticking with variant covers for a minute – you’ve seen the Matthew Clark/Kevin Maguire jam variant covers for DOOM PATROL issues #1 and 2 in previous posts. I love these covers very much, so I wanted to show you the final one for issue #3, starring Negative Man and a Metal Men obstacle course. We’ll start with Keith Giffen’s layout, and then there’s Kevin Maguire’s inks, Matthew Clark’s pencils over Kevin’s inks, Matthew’s and Kevin’s inks together at last, and finally the color by Guy Major. Giffen's rough shown above and the near-final image below. 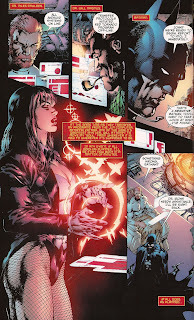 Gehrlein also shared the cover for the second Blackest Night issue, issue #5 to be exact, but I will also share that at a later time in a post I'm working on covering DP's Blackest Night involvement. All in all, I'd say this is a well-timed revelation by Gehrlein. She must have known I needed some Negative Monday material. Sorry friends, foes and gentle readers, I've been neglectful in my posting responsibilities. My life's been a little busy, between work, reviews, and life. One f the reasons for my negligence is the fact that I'm going to the Toronto Fan Expo tomorrow. I've been blessed with a wonderful bride who has no problem shedding herself of me for one weekend a year. The past two (three?) I've gone to Baltimore. This year, I chose to go to Toronto. When I go to these cons, I like to get my geek on, but I'm not a talented enough seamstress to cosplay. Of course, I don't have the physique for it either. What's this have to do with Elasti-Woman? Well, it has this to do with her. I made this image for a t-shirt. It's just a simple iron-on dealio, but until Graphitti or DC puts out a DP shirt, it'll do. I used Matthew Clark's promo poster image (with his permission), the old logo from the 1980s series, and the head circles from Premiani's heyday. A little from each, to make a pretty killer image if I do say so myself. There you have it, a bit of a cheat, sure, but it does have Rita on it. The big internet-cracking blog event of August 2009 is finally here! Happy Super Powers Day! A consortium (fun word, isn't it?) of bloggers are celebrating the 25th anniversary of those wonderful old Super Powers toys. Organized by my man, the Irredeemable Shag, we're all taking a look at the comics that came along with these beauties. Given the impressive range of figures that were included in the line, there is an equally impressive line of bloggers. 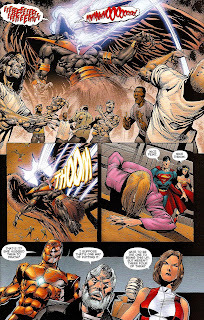 Superman's Super Powers existence is examined (that was fun to type!) at the Fortress of Baileytude! Batman is covered by Tommy over on the Batblog. Shag himself has a post on his Firestorm site and his Once Upon a Geek home where he discusses the Dr. Fate figure as well as the proposed Blue Devil and Shockwave figures. Kelson Vibber provides some insight into the Flash's comic. Flash also gets some love from Brian Dixon on the Fastest Man Alive blogspot. As always, Rob Kelly covers the seven seas with Aquaman, who was my personal favorite of the first wave of Super Powers figures. 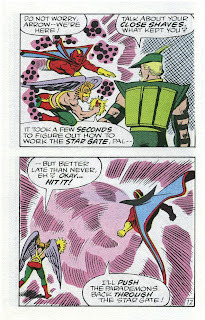 Luke covers Hawkman while Adam heads for the Arrowcave. 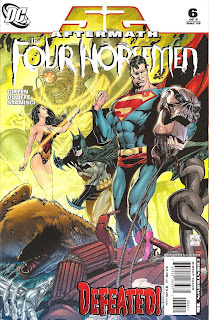 Frank covers the Martian Manhunter over at the Idol Head. The Joker even gets some love, courtesy of Bee. 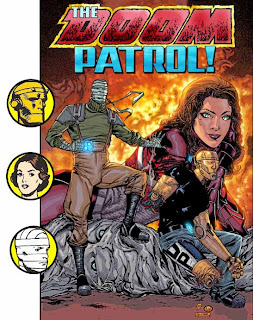 Since this is a Doom Patrol blog, it bears mentioning that the DP - not a one of them in any incarnation! - were grossly overlooked and unable to participate in the Super Powers line. So when Shag issued a call to arms for parties interested in sharing the love for the Super Powers figures and their mini comics, I jumped on the chance to give Reddy some attention. 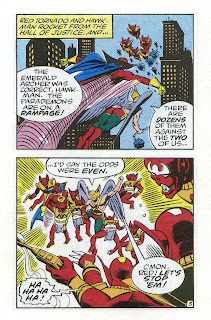 After all, if it wasn't for Red Tornado, I would have never sunk hip-deep into collecting comics as a kid. 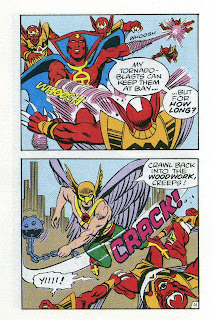 Extrapolate that to now and this blog wouldn't exist if not for Red Tornado. Stretch it out a little further and the Sunday post featuring Niles Caulder and Reddy makes a little bit of sense now, right? 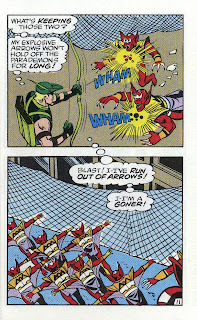 So, without delaying the inevitable, here's the Red Tornado mini comic, guest starring Green Arrow and Hawkman. Great cover of Reddy opening a can of fist on the Parademons. Classic logo too. Before you read any further, please remember the Super Powers line was geared towards KIDS, not crazed, continuity-obsessed grown collectors who would never even dream of playing with the toys. These are supposed to be fun comics that give the reader a gist for the characters without burdening the reader with too much knowledge. The battle against the Parademons is what the Super Powers line was all about. Cool visuals, great characters, unique powers and uses for those powers. Did I mention the fact that this book is cool WITHOUT Superman, Batman, Wonder Woman, Aquaman, Flash, or even Green Lantern? Bah! 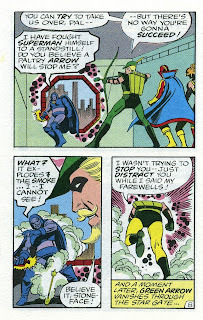 Blinded by a paltry smoke arrow! Isn't it great how the comics are so simplified. 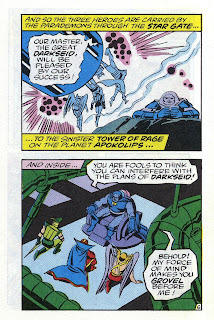 After all, would these three truly stand much of a chance against Darkseid? 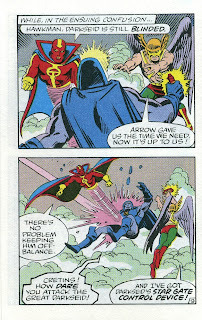 That Hawkman is a bully, pushing Darkseid down when he's blinded! 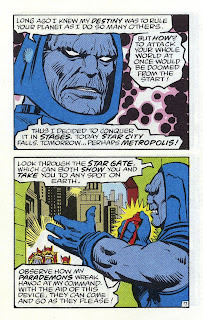 Imagine what a totally cool villain kids would think Darkseid is once they discovered the "real" Darkseid in comics. 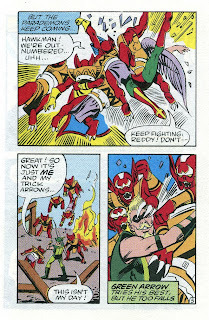 The Super Powers heroes were definitely a team. No doubt about that. 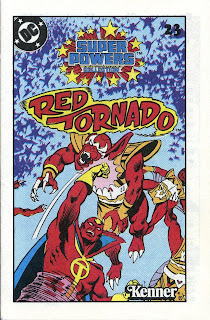 Tornado doesn't get a chance to guest star in any other hero's mini comic, but he does appear in the comics for Steppenwolf, Mantis, Kalibak, and Darkseid. Undoubtedly this figure helped Reddy find a whole new audience. From here, Reddy found his way into molded plastic quite a few times again. Those adventures will eventually be covered on my brand-new, incredibly irregular blog - Red Tornado's Path. Nothing to see yet, but soon, my friends. Soon. Once again, I want to drop a shout out and a huge, "Yeeee-ha!" to Shag. His passion for things comic related and just plain fun is something to behold. Additionally, Rob Kelly hit us with the logo at the top of this post, while Tommy from the Batblog crafted the logo at the bottom of this post. We now return you to your regularly scheduled Doom Patrol blog. Gonna try something new for this Monday. Here's one panel negative panel wherein Cliff is morning the brutal death of a teammate and Larry decides to handle the situation in a more abrasive manner. Until the next issue, Negative Mondays will be a panel parade from Doom Patrol (volume 5) #1. There are some characters who have always seemed like natural shoe-ins for DP membership in my book. For whatever reason though, it just isn't possible for many of these characters to make the leap. We've already touched on some of the times Aquaman interacted with the DP. Fans of any incarnation - especially Arcudi's and Byrne's versions - understand how logical a fit Metamorpho would be. Power Girl seemed to stop by quite a bit. 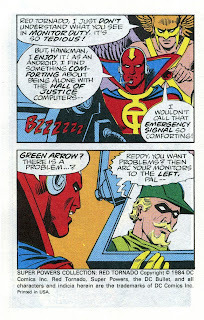 One character who really seems like a natural fit to me is Red Tornado. Today, several of the smartest men in the world will attempt to move the set of programs and data that constitute my sense of self into a new artificial body. The first one Reddy mentions is Niles Caulder, the DP's beloved (ahem) Chief. 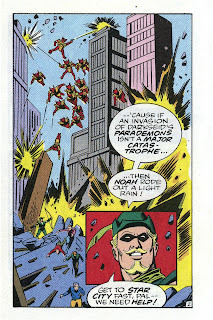 Caulder shows up again a time or two in JLA, but never really says much. 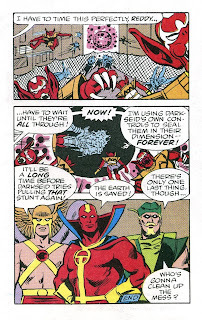 The fact that he's called upon - not to mention the current base of operations for the DP on Oolong Island (remember T. O. Morrow was there in 52) and there you have a connection drawn between Red Tornado and the Doom Patrol. Remember a few months back when we did the Crisis on Earth-Blog? In another attempt to generate some interest across the internet, the Irredeemable Shag has organized another crossover. What is this fabulous new crossover you ask? Well, this post is a major hint. Check back Tuesday, just be sure to do so before the internet cracks in half. your input means alot to us. Pull no punches. We can take it. We welcome it. maxi-dress? If you last until issue seven, you'll know. 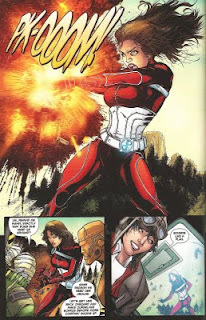 Even if you weren't a fan of Morrison's version of the DP, you knew of Crazy Jane, and maybe even liked the character. I'm looking forward to seeing what our DP masterminds Giffen and Clark can pull together for this young lady. . .
Deliquency, thy name is Doug. Sorry friends, it's been a crazy busy couple of weeks since the last post. My extracurricular project (aka second book) imploded, I took a vacation, and also had to adjust my work the week before and after to accommodate my vacation. Since then, I've been busy trying to get some stuff happening for this little ol' site here. Stuff like an exclusive interview with a certain penciler of this certain series we all are fond of. Yes. That Clark guy. More on that next week. For now, I'm thinking this might be the final Elasti-Girl Friday, as Giffen and crew are making a push to change Rita's moniker to Elasti-Woman. 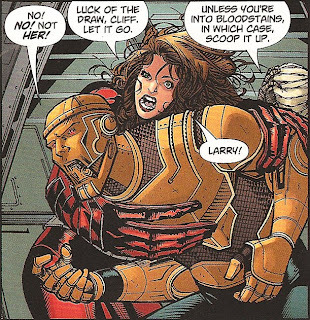 As "Joe" pointed out in the comments a few weeks ago, Rita has been called "Elasti-Woman" before, but that was in reference from the press, who also dubbed Cliff as "Automaton". With that change, in addition to the series actually being published now, I want to change things up a bit and make things a little more regular. Will I be publishing every day? Oh heck no. My life doesn't have that much flex time. I will, however, make a more concerted effort to have at least one post per week. My goal is no less than three, but for now, let's focus on one at a time. On to the matter at hand. Here's some panels from the first issue of the current volume of Doom Patrol featuring our gal, Rita. I was going to scan the pages from her bungalow, but or the ones where she's dining with Rocky, but decided this sequence was a good place to start. This is the scene where the team is trying to escape from Buena Suerte. Negative Man has disabled most of the opposing helicopters, but left one for Rita to handle. 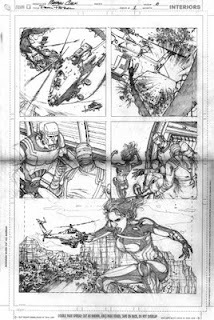 The first image below is a scan from Matt Clark's pencils. I thought it would be a nice contrast to the finished page that follows. Here's what happens when a mad Elasti-Woman meets a helicopter. I gotta say, when I read this, I laughed out loud at Larry's reaction. Larry's cynicsim knows no bounds. There you have it. The first official Elasti-Woman Friday (just doesn't ring as well as Elasti-Girl Friday) featuring published art from the first issue of Doom Patrol. I managed to snag a copy of the variant cover this week. I adore that Kong-inspired cover. I'm looking forward to what other covers the crew comes up with. 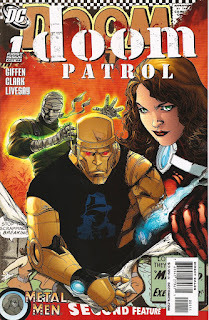 As promised, I reviewed Doom Patrol #1 for Comic Book Resources. Here's the link to my review, wherein I express the following thoughts and, oh, so much more. 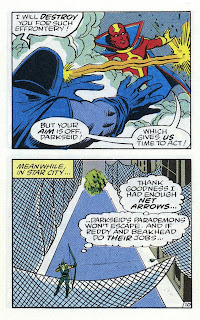 Giffen quickly establishes that this team is a strike force of sorts, not a bunch of pals chumming around. They operate from Oolong Island under the auspices of Niles Caulder, who has manipulated them in the past and most likely won't hesitate to do so again. 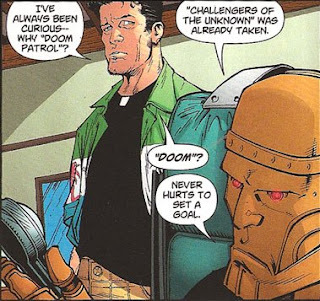 This Doom Patrol seems to have a purpose, at least moreso than some of the teams that ran under the "Doom Patrol" brand in the past. I look forward to what Giffen's going to put these characters through and how Clark renders it. The world Giffen is building isn't going to forget where the Doom Patrol came from, nor is it going to lose what makes the DC Universe special, and that gives me great hope for what is to come. The big day is here! Doom Patrol #1 hits the stands and makes quite an impact doing so. I'm not going to spoil anything, save to say someone doesn't make it home. I'll share a little more later. I'm going to use this issue as fodder for the next week or so of posts. Until then, here's THE panel from the book for me. 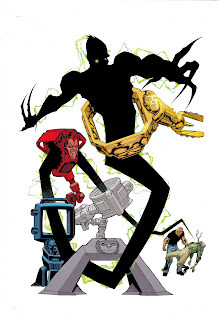 This issue also contained a sneak peek into Magog, as well as the Metal Men backup (or second feature as DC prefers to label it with political correctness only a standards auditor can appreciate). I truly enjoyed Metal Men, even if it was thematically 180º away from Doom Patrol. Seriously, how can any COMIC fan not find something to enjoy from a tale by Giffen, DeMatteis and Maguire? Even though it was just a preview, Magog is starting to lose me as the gore quotient seems like it is going to be pretty high. We'll see. More later, after my Doom Patrol review is posted on CBR. Spoilers for the review: I gave the issue 3.5 stars out of 5. It needs to stretch a little more for that perfect 5. It has certainly been a long time coming, but it is finally here. I've got to do the 9-5 thing today, but I will be buying (and reviewing) Doom Patrol #1 today (maybe even two copies!). My review will be published over at Comic Book Resources and I will be linking it here once I get a chance. Until then, here's the last panel (well, the full page containing that last panel) featuring the Doom Patrol from 52 Aftermath: Four Horsemen #6. Why should you care? It was written by Keith Giffen and (to the best of my knowledge) is the most recent appearance of the DP. If anyone can correct me on that, please do. I'm just going to share a quick Negative Man related image from the recent Batman: Brave & Bold comic by J. Torres and J. Bone. I also reviewed this one over at CBR. Later this week I will offer up a more in depth look at the book.